No sign of that tool for creating collections from SSRS that was demoed at TechEd yet, though. And wouldn’t it be cool if you could use it to browse through the contents of your file system in the way I showed with Excel and PowerPivot recently? Before I start, I need to declare that since Michael Brönnimann (one of the guys at IBAX behind this product) is a friend of mine I can’t really be considered an unbiased reviewer of this product; however, since I think it’s interesting and deserves wider exposure, I did think it was worth blogging about. In fact I’ve more or less given up reviewing products and books on this blog because I know so many people in the SSAS world that it makes impartiality on my part very difficult; it’s just easier to flag up interesting stuff and not try to make any kind of critical assessment. Basically, it’s a template Analysis Services solution that contains solutions to many cube design and MDX calculation problems that you can adapt for your own project. The idea is that, rather than building everything yourself from scratch, if you bring your own data into an existing solution you’ll be able to build something that’s very feature-rich very quickly without having to spend too much time worrying about the design and implementation of the difficult stuff. And the template itself certainly is very feature rich: it has a full set of time series calculations, many other financial and analytical calculations, different types of currency conversion, showing measures in different scales, formatting and colour highlighting, actions and drillthrough. The next question is, of course, will you actually get any value from a product like this (assuming you don’t buy it as a service offering)? I mean, if you don’t know how to implement this stuff in the first place are you going to be able to adapt someone else’s code to your own requirements? Well, there’s a lot of documentation and some introductory training included in the package to help get you up to speed; and I think if you’re going to learn how to learn SSAS it always helps to have some worked examples to try to understand; and even if you throw away 80% of what you get, the remaining 20% will have still proved useful. If the alternative is to spend months and months developing something, and then finding you’ve made some fundamental mistake in the design early on that you can’t now change, then it’s got to be better. The SQLBits committee is pleased to announce that the next SQLBits conference, SQLBits 7, will be taking place from September 30th to October 2nd at York University. SQLBits is the largest SQL Server conference in Europe and the previous six conferences have established it as a must-attend event for DBAs, developers and BI professionals who work with Microsoft SQL Server in the UK and Europe. This SQLBits will be the biggest ever, with capacity for over 500 attendees. This time SQLBits will be running the multi-day format that was so successful in Manchester and South Wales last year. Thursday 30th will be a training day, featuring in-depth, full-day seminars delivered by a number of well-known SQL Server professionals; Friday 1st will be a deep-dive conference day with advanced sessions delivered by the best speakers from the SQL Server community; and Saturday 2nd will be the traditional SQLBits community conference day, with a wide range of sessions covered all aspects of SQL Server at all levels of ability. There will be a charge to attend days one and two, but day three will, as usual, be completely free to ensure everyone can have the opportunity to attend. The conference will be held at the Heslington Campus of York University, a modern venue easily accessible from all parts of the country by road and rail. Session submission is open now and we are looking for presentations on the seven main parts of the SQL Server toolset: the SQL Server relational database engine and TSQL, Integration Services, Reporting Services, Analysis Services/PowerPivot, Master Data Services, StreamInsight and Parallel Data Warehouse. As a community organisation we are keen to have as many people involved as possible, so we welcome submissions from new or inexperienced speakers. To submit a session, please go to http://sqlbits.com/information/SessionSubmission.aspx. If you have a SQL Server-related product or service, SQLBits is a unique way of promoting it to hundreds of SQL Server professionals and decision makers. We can tailor sponsorship packages for SQLBits to your specific business needs; anyone interested in sponsoring the conference can get more details by emailing us at contactus@sqlbits.com. Just to sum up – speakers and sponsors, we need you! I’ve not looked at it yet (it was only released a few hours ago) but I’m told it features an updated set of rules for SSAS. Running the BPA over your existing cube is a good way of spotting bad things you might have done by accident or because you didn’t know they were bad. My whole life is on my laptop hard drive, and as a consequence my laptop hard drive has a lot of stuff on it. Luckily, when I need to find something, there’s always Windows Search to help me out – but even so a single search query can return a lot of data. How can we make sense of all the data in the Windows Search Index? Well, we can use PowerPivot of course! First of all, you need to make sure you have the OLE DB Provider for Search installed. If you don’t, you need to download and install the Windows SDK. Then you can open up a new Excel workbook and open the PowerPivot window. Next you need to create a new connection by going to the Home tab, clicking the Get External Data/From Other Sources button, and then clicking the Others(OLEDB/ODBC) option. Do not try to click the Build button and select the provider from the list – when I did this, I got the error “Provider is no longer available. Ensure that the provider is installed properly”. Next, choose the “Write a query to specify the data to import” option (again, if you choose the “Select from a list of tables…” you’ll get an error) and enter your SQL query. Notice that I’ve had to cast some columns to DBTYPE_BSTR – I found that if I didn’t do this, the columns simply didn’t appear in the query results in PowerPivot. Other things you can do here in the query include searching for all items that include particular words or phrases, or which are above a certain size, or have a particular file extension. There are plenty of tools out there that help you analyse this type of data but I doubt any of them can do what the PowerPivot/Excel combo can do. 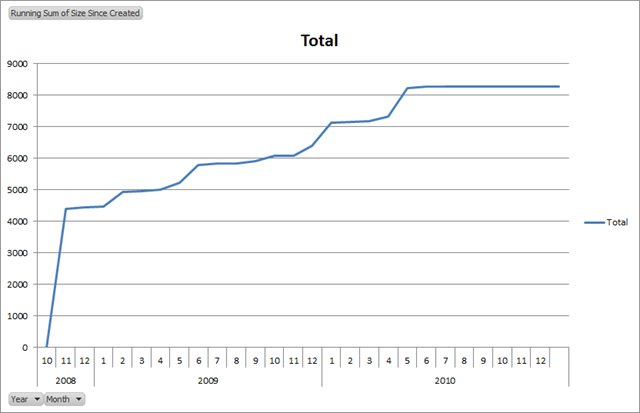 And it’s this kind of personal BI that PowerPivot makes easy. The only thing missing is an API which would allow you to build the SQL query used here dynamically: imagine having an interface where users could type their own search terms and then be able to analyse the results in PowerPivot at the click of a button. Hopefully PowerPivot will get an API soon. And as I’ve said before in the past, wouldn’t it be cool if Bing could do this kind of thing with web search results and data found on the web? 01:25:20 Pivotviewer Extensions for Reporting Services. 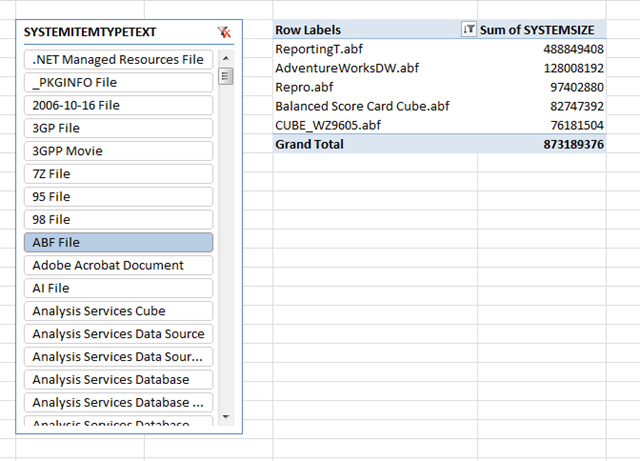 As far as I can see, this is a new bit of SSRS functionality that does something like the following: execute a data-driven subscription to generate multiple SSRS reports, then load them into the new Silverlight control-based version of Live Labs Pivot, so the output of these reports can be analysed. This will be available in the next thirty days, so I guess early July. It makes for a very visually appealing demo but if I’m right about what’s happening here then it seems a bit of a hack. Live Labs Pivot needs to be properly integrated into the BI stack! 01:32:30 the ability to define KPIs in PowerPivot. The funny thing is, ever since KPIs were introduced in SSAS 2005 I have worked with hundreds of companies using SSAS and I have never, ever seen anyone using KPIs in production! But this is slightly different and it’s got a nice visual designer, so I can see how KPIs in PowerPivot would be very useful. 01:34:45 new record view for viewing data in the PowerPivot designer, a better way of working with wide tables and editing the calculations on them. Handy. 01:36:30 importing a PowerPivot solution, from Excel, into BI Development Studio. You get the same PowerPivot designer UI in BIDS as you get in Excel, but now you are able to use source control, develop offline and so on. 01:37:55 lineage and impact analysis for DAX calculations – a diagram showing the dependencies between DAX calculations. Good, but lineage and impact analysis is needed for much more than just DAX calculations – it needs to cover everything from the structure of the relational data warehouse to SSIS, SSAS and SSRS reports. 01:39:30 2 billion rows of data loaded into a server-based instance of SSAS running in in-memory mode, from a project developed in BIDS. And of course, it’s fast!